A few months ago BBC Broadcast introduced a 'site owners database', which looked at the directories on the live BBC site, and attempted to gather contact information for every area of BBC.co.uk. It is very useful in my day-to-day work, but even more useful because it provides a facility to look for orphan sites - top level directories on BBC.co.uk which nobody has claimed. Some of these turn out to be very old sites that are still available to the public, as long as you know where to look. The site now states that it is closed, and directs the user to BBC News Online. However, much of the content remains. In fact there are still the profiles of around 4,000 electoral candidates from 1997 stored on the BBC's live servers - although you can only access them by directly calling the individual URLs. Of course, even if the HTML survives, there is no guarantee that the dynamic applications attached to a site will - and that is the case with the Election 97 site. Sadly Peter Snow's Swing-o-meter no longer swings. Clicking on the graphic causes the site to open up a thoroughly modern BBC 500 Internal Server error page within the frameset. Likewise the Virtual Election '97 calculator no longer predicts the future political landscape. Written by Tom Payne of Cambridge University the application allowed the user to enter a share of the total votes for each major party. In the deluxe version users could even select the extent to which tactical voting would influence the vote for each party, and the algorithm would then predict the outcome for Britain's eagerly awaiting huddled masses. Now, whatever you enter, you get a server error. There is a valuable lesson here in the physical possibility of archiving sites. It is relatively easy to mirror and archive the file structure of a website - but it isn't so easy to 'archive' dynamic web environments. Even if the code for the Virtual Election application was still on the live servers, there is no guarantee that 8 years down the line it would still run on the server configuration we use. In order to retain the whole user experience, not only do we need to take snapshots of the website, but we need to take snapshots of the type of equipment, the versions of languages, and server configurations. 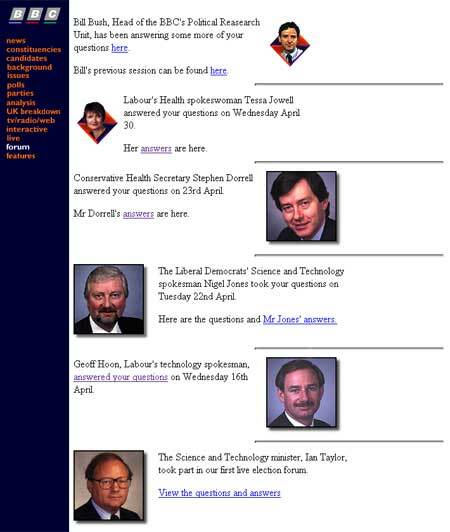 Elsewhere on the Election 97 site there still exists a series of transcripts of online forums where users were able to email in questions for various ministers and would-be ministers. I noted Geoff Hoon, as spokesman for technology, sporting a rather nifty tache. The results page on the site must be one of the first examples of the BBC responding online to a 'breaking news' story - and it is still frozen there in time. Breaking out of the standard navigation for Election 97 at http://www.bbc.co.uk/election97/live/index.htm you can still see a complicated frameset given up-to-date totals for the parties in the left-hand nav, with a news-flash that the final result is LibDem gain Winchester, plus a mini-frame at the bottom declaring "Tony Blair is the new Prime Minister - Biggest Ever Labour Majority"
This entry is one of a series on currybetdotnet looking at archive material from the early days of th e BBC website. The sites looked at were the Budget 97 site, Diana Remembered, Politics 97, Election 97, Budget 96 and Budget 95. Additionally, in the middle of the series there was an Aprils Fool post about a BBC site for the 1996 Doctor Who TV Movie. By Martin Belam on 31 March 2005.